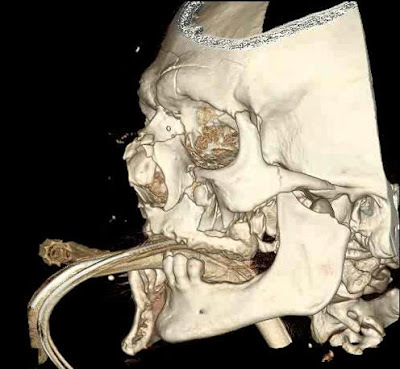 This patient was not using a helmet.. Extensive facial and mandibular fractures are present. The patient has an endotracheal tube, and a orogastric suction tube. The vertex (top) and posterior skull are not damaged. These portions were excluded in the initial scan and appear as though they are missing on the 3D rendering. Besides the absence of teeth up top, there’s a whole lot of other “wholly $#!+” going on in this image. Thanks to the Honky-Tonk Dragon for digging up this piece. Still gives me the jibblies just thinking about it. Thanks for posting it though. It’s made me think I ought to change my helmet pretty quick. How do you think you look now Mr. IEatThroughAStraw? Please, wear the proper gear people! I figured something like this would illustrate the point without making people faint or hurl. I wish I knew the specifics. What was he riding? How fast was he going? What did he hit? In the end, I hope he recovers quickly and is able to someday educate others on the importance of being a safe and responsible rider. I have some images like this of my friend John who ran into the side of a garbage truck over 18 months ago. I was in the hospital as they were looking at this kind of stuff and it really creeped me out. I have been working on a post about the resolution of his accident but cannot seem to finish because it’s so disconcerting. Maybe I can wear two helmets…. On every ride I will see a thonged, open faced, short wearing gloveless nut ride and weave at frightening speeds in between moving traffic. Near misses to which they are oblivious. I used to work in emergency in a major Sydney Hospital before entering private practice and saw the consequences of such stupidity amongst scooter and motorbike riders. Often they would say oh it was too hot to wear a full faced helmet and all the clobber and theere is not enough storage space. I do know that many scoots provide inadequate storage – sooo: Buy a lock and cables..thread through the jacket and fullfaced helmet and lock. Place the boots (yes they will fold) into the top box. A full faced helmet is only hot when standing still on the warmest of days. And for those few moments just raise the visor!! And as for looking a bit dorky with all the clobber on a small scoot _ I say: tough! !